In food processing, brining is treating food with brine or coarse salt which preserves and seasons the food while enhancing tenderness and flavor with additions such as herbs, spices, sugar, caramel and/or vinegar. Meat and fish are typically brined for less than twenty-four hours while vegetables, cheeses and fruit are brined in a much longer process known as pickling. Brining is similar to marination, except that a marinade usually includes a significant amount of acid, such as vinegar or citrus juice. Brining is also similar to curing, which usually involves significantly drying the food, and is done over a much longer time period. Brining is typically a process in which meat is soaked in a salt water solution similar to marination before cooking. Meat is soaked anywhere from 30 minutes to several days. The amount of time needed to brine depends on the size of the meat: More time is needed for a large turkey compared to a broiler fryer chicken. Similarly, a large roast must be brined longer than a thin cut of meat. 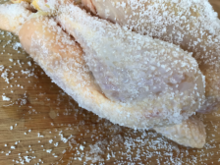 Kitchen salt applied to chicken showing extracted moisture after one hour. Brining can also be achieved by covering the meat in dry coarse salt and left to rest for several hours. The salt draws moisture from the interior of the meat to the surface, where it mixes with the salt and is then reabsorbed with the salt essentially brining the meat in its own juices. The salt rub is then rinsed off and discarded before cooking. The brine surrounding the cells has a higher concentration of salt than the fluid within the cells, but the cell fluid has a higher concentration of other solutes. This leads salt ions to diffuse into the cell, while the solutes in the cells cannot diffuse through the cell membranes into the brine. The increased salinity of the cell fluid causes the cell to absorb water from the brine via osmosis. The salt introduced into the cell denatures its proteins. The proteins coagulate, forming a matrix that traps water molecules and holds them during cooking. This prevents the meat from dehydrating. As opposed to dry salting, fish brining or wet-salting is performed by immersion of fish into brine, or just sprinkling it with salt without draining the moisture. To ensure long-term preservation, the solution has to contain at least 20% of salt, a process called "heavy salting" in fisheries; heavy-salted fish must be desalted in cold water or milk before consumption. If less salt is used, the fish is suited for immediate consumption, but additional refrigeration is necessary for longer preservation. Caviar and other types of roe. Pickled vegetables are immersed in brine, vinegar or vinaigrette for extended periods of time, where they undergo anaerobic fermentation which affects their texture and flavor. Pickling can preserve perishable foods for months. Antimicrobial herbs and spices, such as mustard seed, garlic, cinnamon or cloves, are often added. Unlike the canning process, pickling (which includes fermentation) does not require that the food be completely sterile before it is sealed. The acidity or salinity of the solution, the temperature of fermentation, and the exclusion of oxygen determine which microorganisms dominate, and determine the flavor of the end product. Brine is also commonly used to age brined cheeses, such as halloumi and feta; others are periodically washed in brine during their ripening. Not only does the brine carry flavors into the cheese (it might be seasoned with spices or wine), but the salty environment may nurture the growth of the Brevibacterium linens bacteria, which can impart a very pronounced odor (e.g. in Limburger) and interesting flavor. The same bacteria can also have some effect on cheeses that are simply ripened in humid conditions, like Camembert. Large populations of these "smear bacteria" show up as a sticky orange-red layer on some brine-washed cheeses. ^ a b Benwick, Bonnie S. (November 14, 2007). "Wet Brining vs. Dry: Give That Bird a Bath". The Washington Post. Retrieved 2018-04-07. ^ a b c d McGee, Harold (2004). The Science And Lore Of The Kitchen. Scribner. pp. 155–156. ISBN 978-0-684-80001-1. ^ Kaiser, Emily (February 25, 2004). "Chefs Who Salt Early if Not Often". The New York Times. Retrieved 2018-04-08. ^ "The Science Behind Brining a Turkey". KQED. November 25, 2009. Retrieved 2016-08-16. ^ J. Kenji López-Alt. The Food Lab: Better Home Cooking Through Science. p. 643. ^ Corriher, Shirley. "Why Brining Keeps Turkey and Other Meat So Moist". ^ a b C. M. E. Catsberg (12 March 2013). Food Handbook. Springer Science & Business Media. pp. 119–120. ISBN 978-94-009-0445-3. ^ Rhee, MS; Lee, SY; Dougherty, RH; Kang, DH. "Antimicrobial effects of mustard flour and acetic acid against Escherichia coli O157:H7, Listeria monocytogenes, and Salmonella enterica serovar Typhimurium". Appl Environ Microbiol. 69: 2959–63. doi:10.1128/aem.69.5.2959-2963.2003. PMC 154497. PMID 12732572. ^ McGee, Harold (2004). On Food and Cooking: The Science and Lore of the Kitchen. New York: Scribner, pp. 291–296. ISBN 0-684-80001-2.